The word periodontium literally means around the tooth. In other words, it is the supporting system of the tooth, which includes among others gums and bone. Periodontal disease is a chronic inflammatory disease of the supporting tissues of the teeth. Periodontal disease is caused by the bacteria that accumulate in a niche, «sulcus», a small area where the gums meet the teeth. Once the bacteria (dental plaque) cause the gums to become infected, the gums detach from the teeth and when this infection spreads into the underlying bone, which supports the teeth, a periodontal pocket has been formed. Gingivitis, the first stage of this disease, is usually characterized by reddish, swollen rounded, bleeding gums. 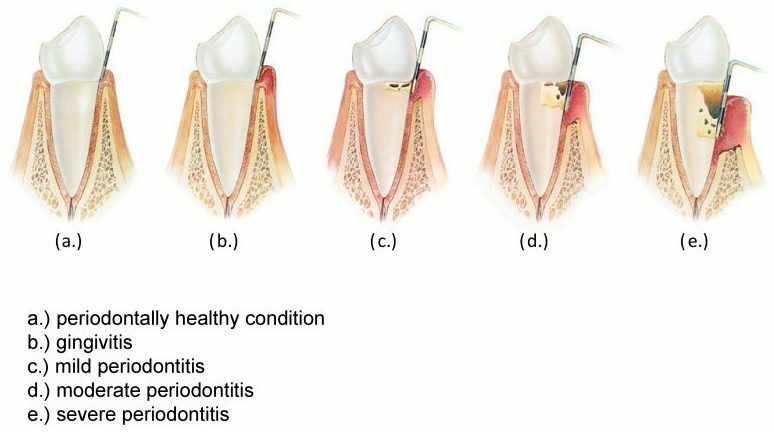 When gingivitis is properly treated, the whole situation turns into the previous healthy condition, which means that this type of disease is reversible. If gingivitis is left untreated, it may turn to periodontitis. In such a case, inflammation of the gums has been extended deeper and bone has been destroyed (irreversible condition). The higher the amount of bone loss, the deeper the pocket and this leads inevitably to tooth loss, if not treated early enough. Which are the most usual types of periodontal disease? Apart from chronic gingivitis, the most usual type of gingivitis, there are also some other forms such as gingivitis of pregnancy and acute necrotizing ulcerative gingivitis. The first one is related to hormonal changes of the pregnant and the second one is characterized by necrosis of soft tissue and pain. Chronic periodontitis is the most often seen form of periodontitis. It usually affects adults, and is characterized by gradual, quite slow rate of bone loss, with periods of exacerbation and recession. Early onset periodontitis is a more aggressive type of periodontitis, and affects younger patients, who are systemically healthy. In these clinical cases, bone loss is very rapid and it is always imperative that the rest members of the family are checked by the periodontist (strong possibility of familial aggregation of the disease). Periodontal disease is a multifactorial disease. 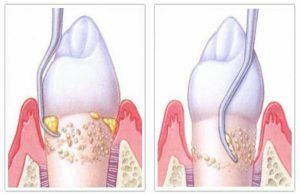 Although dental plaque is the only cause of it, there are several factors which if they are present increase the probability of disease occurring, and the opposite. Many people suffer from periodontal disease and quite often they are not aware that this is present. This is why general dentists are absolutely responsible for diagnosing gingivitis and especially periodontitis. 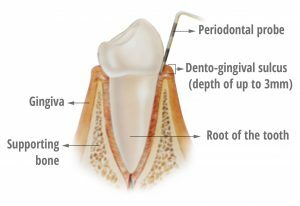 How easily periodontitis is diagnosed? Very easily with the usual dental equipment: a periodontal probe and a radiograph. Under normal circumstances, the depth of the sulcus should not exceed 3mm, when a periodontal probe is inserted between tooth and gums. When clinically a periodontal pocket of 4mm or more is found, which is confirmed with radiographic appearance of bone loss, then this patient suffers from periodontitis. During the first visit, the periodontist takes medical-dental history, periodontal chart measurements, and sometimes radiographs. It is always helpful if the patient has already a recent panoramic X-ray. In many cases, extra-radiographs are required. What is the therapy of periodontal disease? With the use of local anaesthesia, the infected root surface is scaled and planed, removing in this way bacteria and their products. This type of therapy is performed with use of either manual or mechanical (ultrasound) instrumentation. During these dental sessions patient are also instructed on various methods and means of oral hygiene. After a short healing period, if there are still residual pockets in the mouth of the patient, it might be necessary to correct them with the surgical approach, during which root surfaces are exposed and scaled, supplementary. In some cases a regenerative procedure might be the indication. 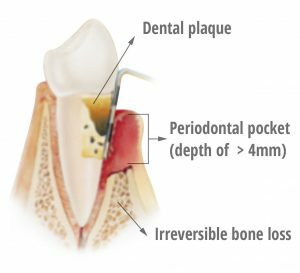 Periodontal surgery eliminates or reduces pocket depth, maintaining teeth in the mouth. This is perhaps the most important phase of the whole treatment. A periodontal patient must be checked, regularly by the periodontist, depending on the extend of the disease. High level of oral hygiene is a prerequisite for a successful periodontal therapy. 1. It is necessary to brush our teeth every day with the right toothbrush. Electric toothbrush, when properly instructed, is always better compared to a manual one. Interdental spaces must be cleaned with the use of dental floss, or interdental brush.